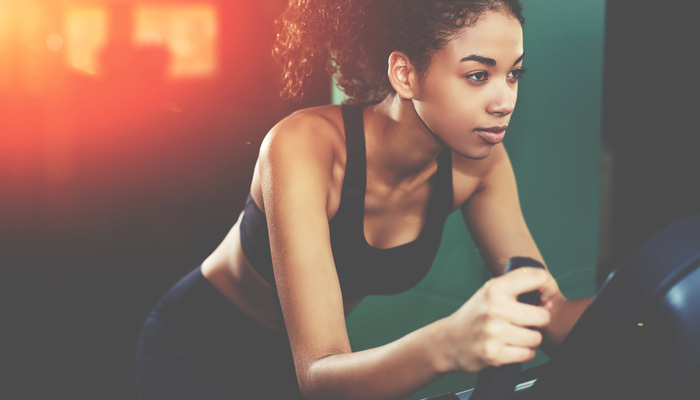 Spinning is a great way to get into shape, but it can be tough getting up in the wee hours to travel to the gym or find a spinning class that fits with your schedule. Luckily, there’s a simple solution to this problem if you are struggling to find the time to hit the gym: put a spin bike in your home! To the uninitiated, it might seem like a bike is just a bike, but the spin bike has some unique qualities. For one thing, the spin bike is a hallmark of spin classes at the gym, which are known for upbeat music and an upbeat instructor. They work wonders at keeping you pumped and burning calories. Aside from its gym roots, the key difference between the spin bike and a typical stationary bike is the flywheel. The spin bike features a large wheel, usually in the front and separated from the pedals, that provides resistance and momentum to mirror the experience of riding a bike outdoors. These flywheels are usually heavier, weighing in at more than 30 pounds. With its unique flywheel setup, you can expect an intense workout on the spin bike! What to Look for in a Spin Bike? If you’ve browsed spin bikes online, you may already be overwhelmed by all of the choices. Like with anything, when you’re shopping for a spin bike, you’re trying to find the features you need at the best possible price. Resistance: The best bikes have a large range of resistances for novice and expert athletes alike. Support: You want a stable bike that holds its own, so you can focus on your workout. Materials: The bike’s longevity is dependent on the quality of its materials. Technology: Technological innovations can make your biking experience better. 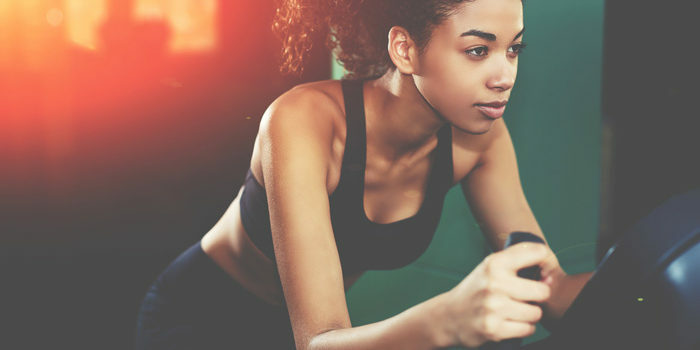 There are a lot of spin bikes out there to choose from, so to make life a little easier for you we are rounding up the top five spin bikes for working out at home! This spin bike uses a caliper style resistance mechanism and a 24.3-pound flywheel. This could be a problem to some users because the heavier the flywheel the smoother the ride. Some riders may experience some rocking while using this bike. It features an LCD with five different functions to display Time, Speed, Distance and Calories. We’ll be the first to admit that this bike is best suited for casual users who want to ride while watching television rather than pushing themselves for a hard workout. If you are looking for style and durability over whizbang features, then the Keiser M3i may be your best choice. It features magnetic resistance instead of physical resistance, so you’ll be able to spin to your heart’s content without making a lot of noise. Great for workouts after the kids go to bed! There’s a computer display which can offer a variety of metrics such as heart rate, RPM, elapse time and resistance level. It also features Bluetooth connectivity so you can transfer your workout data to a compatible app. This model of spin bike lives somewhere in between “affordable” and “durable” for those who don’t want to spend a fortune but also don’t want to buy a piece of junk that’ll break down in a few months. It uses a 40-pound flywheel to create a smooth ride and a caliper style resistance system. Calipers are a bit less reliable than direct friction brake pads and will need to be adjusted as time goes on, but again, the sacrifice is made for affordability. There is no computer display, but it’s easy enough to mount a portable device if you already have one. Even without the extra features, the Sunny Health & Fitness Belt Drive Indoor Cycling Bike is a sturdy machine that feels good to pedal. You can go from sitting to standing without wobble. Schwinn may be best known for their traditional bikes, but this is a model of spin bike you should absolutely consider. If you want a spin bike that looks more like a traditional bike, then it will definitely catch your eye. Like the Keiser M3i, the Schwinn features magnetic resistance rather than friction. With six working magnets, you can take this spin bike from beginner level to professional athlete level at the turn of a knob. There is no display, but the spin bike features Bluetooth technology so you can connect your favorite tracking app. If you are looking for a spin bike that feels like an authentic outdoor riding experience, then look no further than this Schwinn. If you are looking for a high-end spin bike, then the Peloton Bike will draw your eye. It features magnetic resistance, a 21-inch display with built-in speakers, microphone and camera. You can connect it to WiFi and also supports Bluetooth audio and wireless ANT+ heart rate straps. Why do you need all that? To join a virtual spin class, of course. Peloton’s online platform lets you watch live spin classes, previously recorded spin classes or even host your own! The online platform costs $39 per month, but those who live, eat and breathe spinning will find massive value in The Peloton Bike and its features.